A review of museum pioneer Nina Simon's new book, The Art of Relevance. Tom Pearson. Credit Christopher Duggan. TOM PEARSON is one of the artistic directors of Third Rail Projects, along with Zach Morris and Jennine Willett. Hailed as one of the foremost companies creating site-specific, immersive, and experiential dance theatre in the United States, Third Rail Projects is dedicated to re-envisioning how audiences can engage with contemporary performance. They are the creators of the long-running immersive theatre hit Then She Fell and the new immersive sensation The Grand Paradise, which is playing in New York through May 29, 2016. More information can be found at thirdrailprojects.com. Odyssey Works: What are you seeking to accomplish with your work? Tom Pearson: In all of my work, I am hoping to give audiences intimate and transformative experiences by making room for them in the work and making the work about them. I hope each piece becomes a Rorschach blot for their own reflective experiences and takes them on a heightened symbolic journey. At the end of the day, I hope they see and examine something of themselves in everything I make and that they walk away having perhaps discovered something they didn’t know before. Joshua Reaver and Tara O'Con in The Grand Paradise. Credit Third Rail Projects. OW: You create work that is both immersive and site-specific. Can you explain the relationship between these two qualities? TP: They relate in that they provoke similar approaches to creating work. Many of our public site works focus on the discovery of the narratives that are bricked into the architecture of a place. In site-specific work, there is a rigorous engagement with real-world architecture and a deep sense of place. I think that’s true for immersive work as well, but often it involves creating the place ourselves rather than excavating the meanings of pre-existing space. Immersive theatre lets you create the world from the ground up. The artwork itself exists in that sharp turn when a scene moves from an obvious read into the deeper recesses of possibility. OW: How would you characterize the exchange you facilitate between artist and audience? Where is the artwork itself located? TP: My work is about creating scenarios that keep the audience in mind from the outset—so they are necessary to the work, and each scene is built with that exchange in mind. I think I am trying to achieve intimacy, but also to challenge audience members' expectations, bypass their rational minds, put them in places with smells and tastes and textures that trigger emotional or physical responses and put them into a place of strong receptivity—and then turn a corner to go into deeper, more symbolic, meaningful places. The artwork itself exists in that sharp turn when a scene moves from an obvious read into the deeper recesses of possibility. Roxanne Kidd in Then She Fell. Credit Darial Sneed. 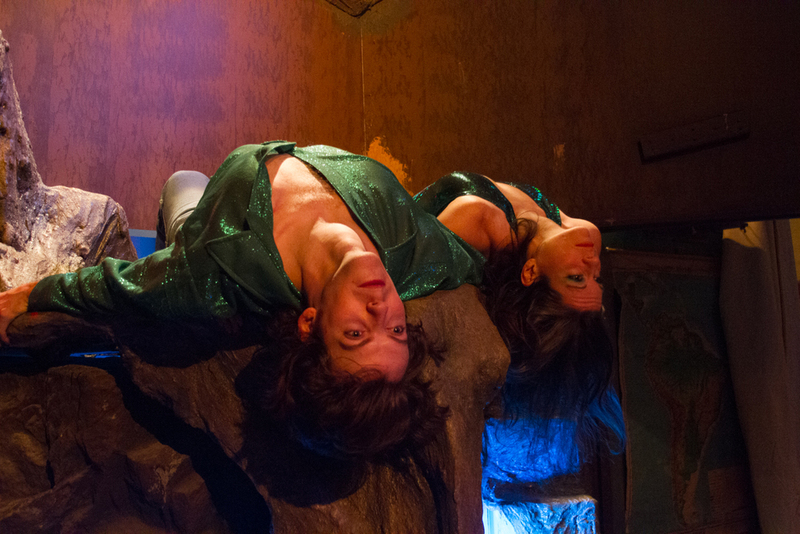 OW: Unlike some other experiential art, Third Rail’s pieces seem to have a strong narrative focus, yet they are also clearly structured differently from traditional theatre. Can you talk about the role of narrative in your work? TP: Our narratives are always fragmented, which is the nature of immersive work, and what is most effective about it. Audiences seem to need to hook themselves onto some sort of narrative to navigate the worlds, which is why the writings of Lewis Carroll offer so much to Then She Fell; audiences have some cultural and literary signifiers that are easy to understand, so they can relax a little more into the figurative and fragmented and symbolic aspects of the work. They can go deeper into the dream logic because they have an anchor in the narrative images. It’s harder with something like The Grand Paradise, where we are hooking the audience’s attention onto broader cultural signifiers...like the idea of "paradise," a status quo family from Middle America on vacation, a coming of age, a midlife crisis, the collective cultural fantasies of the late 1970s, and the Fountain of Youth. These are anchor points too, but much looser ones. OW: Immersive theatre is often compared to video games or other interactive virtual experiences. Why do you choose to create embodied experiences? What does liveness mean to you? TP: I think immersive theatre is just a more obvious form of liveness than other theatre, maybe because audience members feel some agency and control in it, but also because it allows them a more personal, tactile, intimate encounter with art. And I think video games and the last 20 years of digital living have made us all crave liveness, while also preparing us to navigate these real worlds that follow video game logic. Like a video game, immersive theatre trains you, sets you loose to unlock possibilities, and then levels you through based on your choices; there are boons along the way, and a sense of discovery as you put the structure together for yourself through your own experience of it. OW: Tell us about your process for creating a piece. TP: It can start and finish in a myriad of ways. Often, it begins with a movement idea that becomes an organizing principle, or a narrative fragment, such as a sense of duality, or a yearning for the Fountain of Youth. Then She Fell began with the idea of a personality torn in two directions, towards two separate agendas, with both halves operating on either side of a real-life event. The Grand Paradise was inspired by archetypal psychology, by the idea of characters representing different aspects of a single psyche. I envisioned that psyche being that of a place, a sentient place that gives birth to a pantheon of archetypal characters who promise to fulfill audience desires. From those kinds of starting places, the choreography, writing, and scenarios spin out around the idea of audience inclusion and what that could mean. How can audiences and characters be given the same offerings and have synonymous experiences in a safe space?